Filled with amazing, unique details, you will find joy in every room as you discover pieces of nature weaved into the interior of this beautiful tree house. We offer a 4 season tree house fully functional with shower bathroom, microwave, refrigerator, coffee pot, a gas fireplace that fills the rooms with warmth during cold weather-very cozy! Unique lake superior driftwood railings going up and enclosing a double loft, which has a queen bed on one side with a cat walk to the other side that has a twin bed and twin sofa sleeper. The main floor offers a double recliner, round table and chairs, fireplace, bathroom, counter top, smart tv with wi-fi and Netflix. Beautiful polished wood slab counter top which was taken from a tree off of our property. Stone inlay details that you will not be able to stop admiring! Stones collected from Lake Superior surround this warm, cozy fireplace. Cozy catwalk which connects the two lofted bedrooms. Staircase decorated with beautiful entwined driftwood branches which are incorporated throughout the house. Homey accents throughout the tree house will help you feel relaxed, comfortable and refreshed during your stay. Loft sitting area that converts to a bed. Windows to allow plenty of light to stream through. 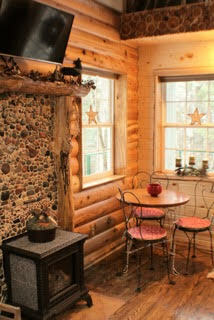 Cozy sitting area on main level that faces the fireplace and is surrounded by the kitchen and dining area. 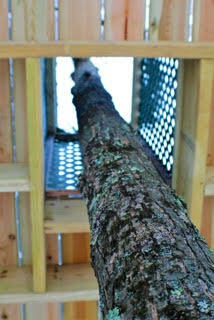 The deck was built around several trees. The view looking up through the deck. Adorable tree house- the deck wraps all the way around it! A huge deck that allows you to enjoy your surroundings from a beautiful viewpoint!